Victor Moses heading for January Chelsea exit? 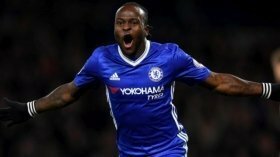 Moses set for Blues exit? Victor Moses' time at Chelsea may be coming to an end with Crystal Palace prepared to offer him an escape route when the transfer window reopens. The former Nigeria international played a key role in the Blues' title triumph during the 2016/17 season and he continued to command a similar position in the season which followed under Antonio Conte. However, with the change in management, Moses has seemingly dropped down the pecking order and he has managed just four substitute appearances in the Premier League and Europa League combined. According to The Sun, the Eagles are interested in offering Moses a return to Selhurst Park where he initially began his professional career before his move to Wigan Athletic. Moses regularly featured in the right wing-back role over the past two seasons but that has not been the case this term with Maurizio Sarri preferring the traditional four-man backline. As such, the Nigerian has only been viewed as a wide player and this has supposedly hampered his gametime to the extent that he is said to be mulling over a fresh challenge. Moses, who still has more than two years remaining on his contract, is likely to be available for a fee in the region of £12m when the transfer window reopens.